IronOne Rugged Display & Computer. Photo source: Hemisphere GNSS, Inc.
Scottsdale, Arizona-based Hemisphere GNSS, Inc. introduced its IronOne Rugged Display & Computer for machine control applications at this week’s CONEXPO-CON/AGG 2017 in Las Vegas, Nevada. 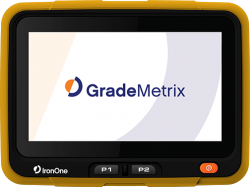 Purpose-built for harsh machine control environments, IronOne meets IP67-standard certification and uses an 8” sunlight-readable LCD display. IronOne adds another system component and empowers heavy equipment manufacturers to deliver their own machine control and guidance solutions to their customers. Connectivity features on the IronOne include ethernet, CANbus, wi-fi, and Bluetooth and offers optional cellular modem for maximum connectivity in the field. Described as easy-to-read, the 8” TFT-LCD capacitive touchscreen display is suited to be inside heavy machinery where different viewing angles are required. IronOne is agnostic and can support site-specific management tools or grading-specific software that requires high-processing speeds and fast update rates. The computer contains an Intel Atom dual-core processor designed for heavy processing requirements. According to the company, Hemisphere is providing the world’s first “full system OEM positioning solution toolkit” for building complete machine control and guidance systems with the announcement of the GradeMetrix™ application software and an array of compatible GNSS hardware components. These include C321 RTK Base & Rover with SiteMetrix™ Site Management Software, A326 Rugged GNSS Smart Antenna, Vector VR500 Rugged All-in-One Smart Antenna, and Vector VR1000 Rugged GNSS Receiver. The GradeMetrix OEM application software platform is designed to manage your machines for any control or guidance application. Whether it is grading, mining, excavating, drilling & piling, or landfill applications, you can rebrand the GradeMetrix software to sell as your own, according to Hemisphere. Hemisphere is at CONEXPO-CON/AGG 2017, March 7-11, at booth# G71925.